Hsgsphoto's Pho-blog-raphy | Sharp shooting outside the box! Sharp shooting outside the box! It’s the internet, do you know where your children are? I received a very interesting call from a friend/client today wondering about something that seems to be coming up for families with children as digital photography grows: She was approached and offered “free” portraits of her daughter in exchange for the photographs being used on a photo sharing or stock photography website. She was unclear on how these sites work, and the future of the images, and ultimately whether it seemed like a good idea to get involved at all. This seems a very timely question, especially as digital tools have empowered many enthusiasts to begin to venture into the realm of “professional” photography. These kinds of offers seem to be becoming more common, and my friend is not the only parent who has approached me with a question about the pros and cons. The advice I gave to her, and that I would give to anyone wondering about giving away the rights to their children’s likeness(or getting involved in any venture, really!) is this: If you have any reservations and have expressed those to the person making the offer, and they are unable to amend the offer in such a way as to put your fears utterly to rest, do not get involved. I love making photographs, and I love sharing those photographs, but I-and every photographer-am providing a service as much as I am providing my own unique vision. There have been many times in my practice that people have asked that I not put their images online-site unseen. It’s important to explain that as an artist, we all make our living sharing our creations, just as it is important for us as professionals who understand the nuanced laws of intellectual property to explain those that might affect our clients. In this case, though a person may be featured in a photograph, and may receive a CD of images as a part of an agreement with a photographer for personal use, the rights to use and credit of those images remains entirely with the photographer, unless specific terms have been stipulated in a release or contract. Though using images when asked not to is legal for photographers, whether or not it is ethical is something each must decide for themselves; personally, I like happy clients that feel they can trust me and that I appreciate their individual sense of privacy and dignity, but the conversation does need to take place about usage, and requires a calm mind and a gentle touch. How I typically approach this situation is with a direct and sensitive dialogue with my clients. I try to choose images with their boundaries in mind and ask their approval before sharing anything I’ve created for them. I have found in almost every instance, this remedies the potential unease. I suggested to my friend in this case that she ask the hopeful photographer to make her an offer including restriction of the use of her daughter’s image to media she is comfortable with. I reiterated to her that if any red flags remain in her mind, or the photographer is unwilling to compromise, to simply say “Thank you but no thank you.” This is her child, after all. The ugly truth is this: In photo sharing sites, such as Flickr, anyone can view and download any image essentially free of charge; for an aspiring photographer, they often participate in stock photography sites such as iStockPhoto, where virtually any image can be purchased by anyone for fees as low as $0.95. Once that purchase has been made, the photographer loses control of how the image is used, and no one knows where it goes except the person who purchased it. Most parents I’ve talked to about this have a creepy-crawly feeling when thinking of their children’s image being used in mysterious ways by mysterious people, especially those who might anonymously make a buck off of it. Hence, my red-flag warning. Also, if agreeing to accept photographs in exchange for providing a model, do not expect to see any proceeds of image sales. In most of those sites, a photographer must sell an image thousands of times before they see a substantial chunk. Again, without the existence of a contract or specified terms in a model release, you also lose control of the image once it’s created. So parents, be aware. Ask questions. The internet is a useful tool, but as with any tool, it can cause unintentional harm in it’s use. It seems to be that the answer to this question-as with most-is communication. I am possessed of the belief that people in general are not really malicious, just perhaps a little short-sighted, or simply unaware of someone else’s position. So, to empower all clients and potential clients, and all my fellow photographers, we must make our positions clear to one another; it falls to each of us to know and state our boundaries in this age of massive online exposure. It is important for an artist and photographer to have the freedom to make their living and provide a high standard of work. Our goal when providing service to a client is to make them happy, and having the opportunity to do so without making unknown errors relies on the client to be clear with us on their hopes and their fears. So often people don’t realize that simply voicing feelings and desires can open doors to creatives such as myself to find imaginative solutions to make each party happy. To keep our relationships well, recipients of service must be clear and courageous enough to ask questions and clarify limits, and the providers must be plain in explanations of terms; in this way, we can remain ethical in the treatment of each other. And if you are lucky enough to get an offer of free portraits, savor them, but keep in mind the old adage that you may get what you pay for! The advice I gave to her, and that I would give to anyone wondering about giving away the rights to their children’s image(or getting involved in any venture at all, really!) is this: If you have any reservations and have expressed those to the person making the offer, and they are unable to amend the offer in such a way as to put your fears utterly to rest, don’t get involved. I love making images, and I love sharing images, but I-and every photographer-am providing a service as much as I am providing my own unique vision. There have been many times in my practice that people have asked that I not put their images online-site unseen. As an artist, I make my living sharing my images, and it is very important for clients to understand that, just as it is important for us as professionals who understand the nuanced laws of Intellectual Property Rights to make it understood that though a person may be featured in a photograph, and you may receive a CD of images as a part of your agreement with your photographer for your own use, the use and credit of those images remains entirely with the photographer(unless of course, other terms have been stipulated in a release or contract). Now, though using images when asked not to is legal, whether or not it is ethical is something each must decide for themselves; personally, I like happy clients that feel they can trust me and that I appreciate their individual sense of privacy and dignity. And the way I typically approach this situation is with a direct and sensitive dialogue with clients, and try to choose images with their boundaries in mind and ask their approval before sharing anything I’ve created for them. I have found in almost every instance, this remedies the potential for unease. I suggested to my client she ask the potential photographer to make her an offer either restricting the use of her daughter’s image to media she is comfortable with. And I reiterated to her that if ANY red flags remain in her mind, or the photographer(which seems very unlikely) is unwilling to compromise, to simply say “Thank you but no thank you.” I mean, this is her child. The ugly truth is this: In most photo sharing sites, with the exception of lucrative higher end ones(any links or info anyone cares to share to expand for everyone on this is much appreciated; I’m pretty long winded as it is! ), anyone can view and purchase any image for a very nominal fee. Once that purchase has been made, the photographer also loses control of how the image is used, and where in the universe it goes to. Most parents have a creepy-crawly feeling when thinking of their children’s image being used in mysterious ways by mysterious people, and hence, my red-flag warning. Also, do not expect, if agreeing to being given photographs in exchange for providing a model that you will see any proceeds of image sales. In most of those sites, a photographer must sell an image thousands of times before they even see a substantial chunk. Again, without the existence of a contract or specified terms in a model release, you also lose control of the image once it’s created. So parents, be aware. Ask questions. The internet is a tool, but as with any tool, it can cause unintentional harm in it’s use. The answer, to me, as a human being who wants to make art, and wants to make people happy, is-as with most things-communication. I am of the belief that people in general are not really malicious, just sometimes short-sighted, or simply unaware of someone else’s position. So, to empower all clients and potential clients, and all my fellow photographers, let’s make our positions clear to one another; talk about what makes people comfortable in this age of massive online exposure. It is important to give an artist and photographer the freedom to make their living and provide a high standard of work and also an opportunity to make our clients happy; so often people don’t realize that simply voicing your feelings and hopes can open doors to creative types to find creative solutions to make us all happy. It falls to all of us to be clear and communicative to keep our relationships well, and to be ethical in the treatment of each other. And if you are lucky enough to get an offer of free portraits(I’m not even going to touch whether this is considered a “best practice” in this conversation! ), savor them! That is indeed a special treat! You can get anything you want! Well, my new life in my old home is off to a promising new start! This is such a great environment, full of creative, energetic people who are a little outside the box, a little unusual, who like to be expressive and individual. This is just what I was craving! Take for example, the delightful Cory and Joe! A couple of about 7 years now, they have traversed the road of being a very young couple, a long-distance couple-and yes, briefly NOT a couple!-and found their destination. I have to say they are brilliant, and the genius continues because they had the clever thought of a Christmas wedding! Now, at first, my reaction was that it seemed like a lot going on, and maybe the holidays would detract from their own celebration for the very observant members of their family, but when Cory explained her plot to have a whole family Christmas/Hanukkah(her father is Jewish!) reception and family holiday weekend, it all fell seamlessly into place! Naturally, I asked how anyone would know what an epic celebration it was without photographs! And naturally, she agreed! So, lucky me, I know what my Hanukkah plans include this year! Every love is unique, as anyone who has ever been in love will attest to. But Cory and Joe have a special brand of affection that reminds me of the giggly 7th graders we once were, crushing on each other and oozing “Isn’t he just so CUTE! ?” Well, as you can plainly see, he is =) and she’s pretty darn adorable herself! They light the glow in one another, and I was lucky enough to bear witness as we did their engagement portraits at a favorite local haunt, Alice’s Restaurant(yes, based on the song!). With chairs being put up and floors swept around us, those two dissolved into a cocoon of nuzzling, laughing, smooching intimacy. I was able to find just a glimpse of that warmth, a small excerpt of their own unique love story. Keep in touch, and see their gallery after the wedding at www.HSGSPhoto.com! Well, I suppose I should start by apologizing, as I came onto my blog, thinking to myself “Well, I have a new website, I should redo the blog to go along with it!”, and discovered I haven’t posted since last August! As some may know, much has changed since the busy, crazy summer! Probably the biggest feature, and certainly the one with the most staying power is that I moved from Savannah, GA to Tucson, AZ. Now, I know this seems like a strange shift in location-and culture!-but it’s actually where I grew up! There were a lot of reasons for the move, but one of the most satisfying is that I have a brand new nephew, and I was not going to miss all the yammering, puking, bubble-blowing, waving-ness for ANYTHING! He is now almost 10 months old and it astonishes me how much he learns and changes every single day. In just one week, we learned how to wave hello and goodbye. We are now quickly learning to reach for a person when wanting to be held or passed to them. It is unlike any other experience I’ve ever had. The trip here was eventful, in both good ways and bad. I was unfortunate enough to deal with a “professional” moving company,(if you want to know more about how that went, look for First Van Lines on the Better Business Bureau of South Florida’s website…) but I’m plum wore out talking about that fiasco! More importantly, I drove cross-country with my best friend of 21 years from Savannah to Tucson! It was epic. I can safely say we didn’t turn on the music until basically the last day, since I haven’t lived near her in almost 10 years! One of the most important things on her little list of perks of going on the trip was a stop in New Orleans. This we did, and it was incredible. HOWEVER, we had the mixed luck to arrive immediately preceding a huge winter storm! In that region, this means high winds, tons of rain, and COLD! The Creole Gardens B&B in the Garden District broke upon us like sunshine through the clouds! The incredible, warm and friendly people introduced themselves to us one by one, then they got us all settled, helped us unload the car, and gave us tips and pointers. When I say that B&B was amazing, I mean A-MA-ZING! I’m not one for 5-star resort-type living(not that I’d turn it down, don’t get me wrong!). Give me a restored old mansion and funky, restored rooms with a unique layout and artwork any day! I only wish the weather had been more forgiving so we could have spent some time in their awesome courtyard. I can’t say enough nice things about our experience there. I hope everyone has a chance to enjoy them someday! They also happen to be a few blocks away form another major feature we both desperately wanted to see….one of the famed above-ground cemetery’s of New Orleans; the Lafayette Cemetery No. 1. The trip rolled on pretty smoothly from there, and I am desperately trying to rapidly get settled in! I have already had a WONDERFUL shoot with a lovely lady who I happen to have known since 7th grade! HA! Love you Tucson, can’t wait to get busy! Amy and Chris tie the knot at Forsyth! It’s fascinating to me these days how many ways there are to find your One. There’s the classic high-school sweetheart or childhood friend scenario(my sister and her husband are a prime example of this! ), there’s the mature love found once you’ve traversed a varied path(a mentor of mine is a perfect specimen!) and there’s the blessed unexpected epiphany. Of course there are so many others, but I’m always interested in the backstory of the couples with whom I work, and their families. Amy and Chris are an example of a modern-day unexpected epiphany. The online phenomenon that may-to some-seem alien at first, and then after, oh, I don’t know, 5 seconds of being around two people who are just right for each other becomes as familiar and warm as love in any of it’s incarnations. These two are a couple of intelligent, straightforward people. Their deep level of self-awareness and sense of steadiness is apparent right away, and they reflected this in their choices about their wedding day. but their plans were foiled by the rain! Friends and family gathered around to watch the union, and though Chris is a deadpan sort of guy, when the emotions come-and they always do!-it’s a moving thing to witness. Amy truly understands and appreciates him, and seeing her bask in his emotions was adorable! Thankfully, the rain did let up in time for us to get some shots outdoors. We were able to visit the garden briefly after all, and of course, venture to Forsyth Park, just across the street. It happened to be the weekend of the Sidewalk Arts Festival, one of the many outdoor festivals hosted by Forsyth Park and the Savannah College of Art and Design. Though this meant we had a large audience for our shoot out there, it also meant some unique flashes of color for some of the images! A beautiful day! A great success for the ceremony and the visit to the park, followed by a carriage ride and a delicious dinner at The Olde Pink House. Congratulations Amy and Chris, and thank you so much for including me! 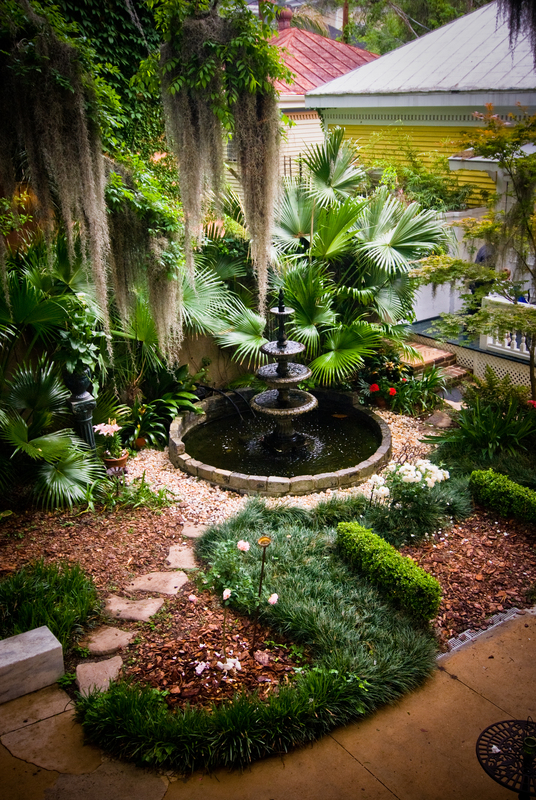 April in Savannah….aaaaaahhhh, is there a prettier time and place for a wedding!? Danielle and Thibaut share a “love that crossed oceans”! They’ve have endured separations while he was living in France and she was finishing school here in Georgia with an unwavering closeness and sense of each other. This wedding was so special; it brought Thibaut’s family from France, and was the first time many of the in-laws had ever met! It drew family members from North Carolina, New Jersey and all over Georgia to share in the celebration; people who don’t get to reunite as often as they’d like. Now, it’s important to understand a thing or two about Danielle and her family: they’re tough-talking northerners, clever, sarcastic and dry in their humor, and royalty in the world of smart-aleck remarks(which is why we are such close friends!)! I’ve known this family for years, and have to say that when I heard Dani had met The One, I was very excited to meet him! I will admit, I was worried for Thibaut at first. He is soft-spoken and mild-mannered, but all it took was my attendance at their Jack-and-Jill Bridal Shower to see that he shared all the qualities that clearly made him and Dani the very best of friends! The wedding was held at the Mulberry Inn in downtown Savannah, April 10th. It was the kind of preparation scene you hope for; brimming with positive energy and excitement, people scurrying around helping each other and assembling the last minute details! Jen, Danielle’s mother, was running up and down the stairs when I arrived, on the cell-phone with a guest or family member, giving directions and looking for some finishing-touch items! When I got to the hotel room where the girls were getting ready, it was amazing to see Dani infused with calm! Certainly there was a quiet excitement about her, but she was beautiful and confident, without a tremor or a harsh word for anyone! Being with the wedding party as they get ready is one of my favorite things to witness; there is such a spirit of cooperation, and gathering around one individual and pulling together to be sure each little detail is perfectly assembled and that she is feeling good infuses the whole day with a sense of community, connectedness and warmth. The ceremony was held in the courtyard, and the weather was ideal! Although, being spring-breezy, it did blow out the Unity Candle…but I have evidence! It was lit! The azalea’s were in full wild bloom, and the weather was a perfect, warm-in-the-sun, cool-in-the-shade spring day! Naturally, we had to venture to the neighboring square to get some shots with the goofball wedding party and the ecstatic bride and groom! Entertainment was provided by All About You DJ’s, those families like to party, let me tell you! Those kids even partied till they dropped! All in all, it was an event where everyone felt like family, even though there was a slight language barrier. Within an hour, it was utterly forgotten. Thank you so much Dani, Thibaut and families for inviting me to be a part of this! To view and order portraits, please visit: www.hsgsphoto.com, visit Events, and enter your email address. March 1 has arrived! Spring has go to be right around the corner, right? I mean, the weatherman saying we may get snow again in Savannah may not mean anything….right….? Well in any case, people were not afraid in the frosty-though sunny!-February that just passed to go ahead and get married, and I’m thrilled to present some of my favorite picks from the wedding of Drew and Angela! Married on Valentine’s Day, in Forsyth Park, at the fountain, of course! Now that’s romantic! Drew is so sweet, he surprised Angela with a note, and of course, since it was Valentine’s Day, she had Valentine cards for her teenage daughters. They had decided to keep it small, simple, and elegant. The friends and family who were in attendance seemed so relaxed, just so happy to see these two people continuing on their journey together. Her girls were clearly nuts about him; her daughter Savannah(hmmmm….now I wish I knew the whole story of their connection to the city…..) wept and hugged him sooooo hard after the ceremony. But it wasn’t by any means a somber occasion, it was a true celebration, from beginning to end! Angela told me she was so excited and nervous she was shaking when I met her and her parents in the hotel room where she was getting ready. And with great chagrin, she mentioned Drew was not the slight bit nervous! Well, naturally, I said, “and why would he be!? He knows this is exactly what he wants to be doing!” Not what she meant, of course, but it was a good ice-breaker! She needed a good laugh(and a big glass of wine, I bet!)! They were too funny….when we got back to the Mansion at Forsyth Park for the reception, he was posing all over the furniture just to make her laugh! She told him he looked like George Costanza! Hahahah! I could hardly see clearly through the laughter/tears to take the darn pictures…. It’s so obvious that these two have a lifetime of laughs coming their way….I’m as thrilled as anyone to see that they found each other….relieved almost, even though I don’t know the whole entire back story…it is just so clear how very much they enhance one another’s lives. Even as a stranger I’m grateful they are together. So, here is their slideshow, it was my pleasure to create it, and it’s now my pleasure to share it with you! My My! How did 2010 come along and find me so FAR behind on my blog postings!?!??! Well, it’s been a tough but inspirational year for many of us, and HSGS Photography is no exception. It’s been a year of creativity, of networking, and of hard work! Among the year’s weddings were the beautiful union of Raquel and Jeremiah, Matt and Esther, Chuck and Alison, Tara and Kevin, Martin and Jennifer, and Ray and Meilin, to name a few! I wish I could tell the full story of all the tenderness and life-changing moments I witnessed this year, but I think to do so, I’m going to resort to my language of choice: if a picture is worth a thousand words, who wants to do the math on how many a slideshow is worth? Find some inspiration, or just revel in the happiness with me here: A Look Back At Some Matrimonial Moments! Thank you and congratulations to everyone, and I’ll see you this wedding season!